Urban Decay is definitely one of my favourite brands and one that lots of others rave about too. I have quite a few of there products as I don't think there has really been a product I haven't liked, so I thought they were deserving if a post. This is one of those products I need to use more but I love it for the summer and on holiday to not only highlight my face but also my body. Its a baked formula so its quite powdery and there is lots of fall out. I have Aura which is a soft peachy shade that really compliments tanned skin. I got this last year as I wanted something lightweight to wear on holiday and in the summer when you can't wear something full coverage and heavy. This gives my skin a good amount of coverage and evens out my skin tone but still looks natural and radiant. I find the longevity of this is good and it still looks great even after being out in the heat. Another cult classic from UD and a favourite of mine, Ive actually almost finished this tube so definitely need to get a new one. This is one of those full coverage concealers but weightless, and that is why you need around the delicate eye area. I like this for both under my eyes and on blemishes suits a good all rounder. This is probably one of the main things UD are famous for and I do own quite a few. They are pretty much the perfect palettes for every neutral shade you will need and they seem to bring out more and more with different colour spectrums. I have 1, 2 and 3, although I gave 2 to my mum as I have so many similar ones, and the Ultimate basics. The original is a selection of neutral browns, golds and a few blue shades, number 3 is more pink, champagne and rose golds and the Ultimate Basics is all matte shades in browns, creams, purples and a black. I only have one of these so far but I really like them, although they seem to have gotten more expensive since I purchased mine. I have a comfort matte one that its really creamy and smooth to apply but with a matte finish. I have Unicorn which is a pastel coral shade and one that I love to wear in summer. I would definitely say these are the best setting spray I have ever tried and one I will keep coming back to. This is great as its more of mist rather than a spray so it doesn't leave residue marks on my face. They have quite a few different versions and I have tried de-slick and all nighter, to be honest I don't find a difference and like them both but de-slick is meant to help control oily skin. 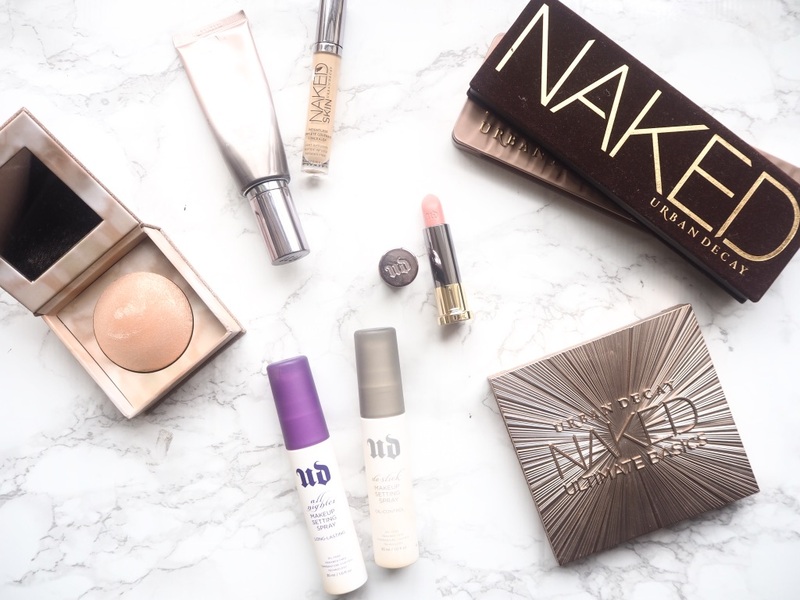 What are your Urban Decay favourites? Urban Decay is my all time favourite brand. For me my favourites have to be the naked skin Concealer, all nighters Foundation, comfort Matte lipsticks & the quick fix Hydra Charged spray. I see lots of my favorites in here! The All Nighter Setting Spray, the Naked palettes and the concealer! I love Urban Decay. Their Naked palettes are to die for, especially the Naked Heat one that just came out. I've been obsessed! I really like the setting spray as well!